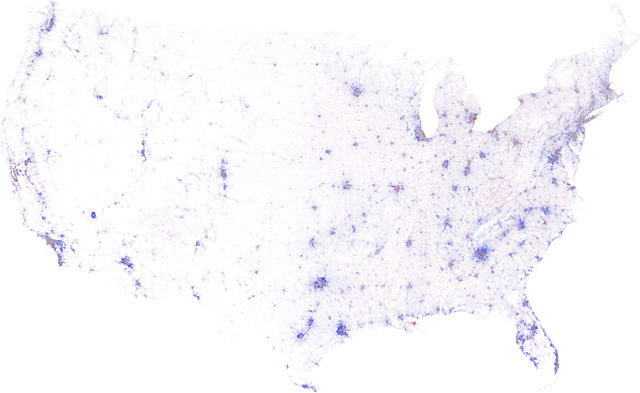 Above is the contiguous United States, color-coded by the change in population density from 2000 to 2010. In urban areas, deep blue indicates that the population doubled (or more), pure red means that everyone left, grey denotes no change, and the intermediate tones represent the spectrum of increases and decreases in-between. Below 5000 residents per square mile, these colors fade with the square root of density towards white, where no people lived in either year. We created these maps from the official U.S. Census 2000 and 2010 block-level population data and boundaries using custom-built cartographic software. Midwest population change, 2000-2010. Chicago upper left, Detroit upper right. It’s easy to miss, but it’s there: a speckled blue island surrounded by a solid sea of red. So, yeah, Detroit is rough, but downtown Detroit… well, that must be the nice part that Eminem was cruising. See maps of major metros and other interesting places, including a post-Katrina New Orleans and sprawling Las Vegas, below. Update: We’ve added more maps!